What is Open Loop Recording? 3-D waterfall diagram showing the open loop recording made by Mars Express of MER-B (Opportunity) during the rehearsal overflight for Curiosity EDL. You’ll see a lot on our coverage of the Curiosity landing about Open Loop Recording,’ something which was hinted at in a previous post about the difference between ‘signal’ and ‘data’. OLR refers to the type of recording that will be made by Mars Express as Curiosity descends towards Mars, and in parallel by ESA’s New Norcia station here on Earth. In open loop recording, we don’t try to decode the bits and bytes being sent by the descending lander but instead try and listen to as much of the radio spectrum as we can, hopefully detecting the tone of the lander’s transmissions within this spectrum. Think of it like listening to a crowd of people – you can either focus on the words one person is saying, or listen to the whole crowd to get a full picture of what’s going on; that’s what we’ll do with open loop recording. On Mars Express we’ll use our UHF Melacom radio to listen in on the UHF part of the spectrum – usually used on Earth for radio and television transmissions; it’s also used at Mars as the frequency that different orbiters and landers use to talk to each other. From New Norcia we’ll be listening to the X-Band part of the spectrum – used on Earth mainly for radar systems but also as a way of communicating with spacecraft across the solar system (Mars Express uses X-Band for its main link back to Earth). Each of these parts of the spectrum is actually a wide range of frequencies and in open loop we listen to as many as possible, creating a diagram like the one in the picture above. In the diagram you can see the first part (on the left) where nothing was transmitting, and then about half way across you see the strong spike of a radio signal from NASA’s MER-B Opportunity rover. The other smaller lines are spikes from interference from units on board Mars Express (much smaller than the real rover signal). The slight curve in the line from the rover is due to the motion of Mars Express overhead creating a Doppler effect – shifting frequency caused by velocity. 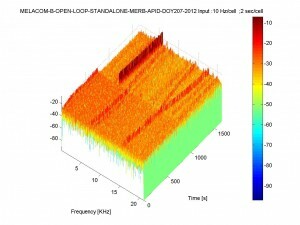 By using this technique, we will see the trace of Curiosity’s signal in the UHF and X-Band ranges and watch as it drifts and changes in response to Doppler, in this case not just because Mars Express is moving overhead but also because Curiosity will be changing velocity as it slows itself to a soft landing on Mars. This will give us a great insight into the progress and success of the landing.